Yes, ladies and gentlemen, I successfully made a savory pie last Thursday. 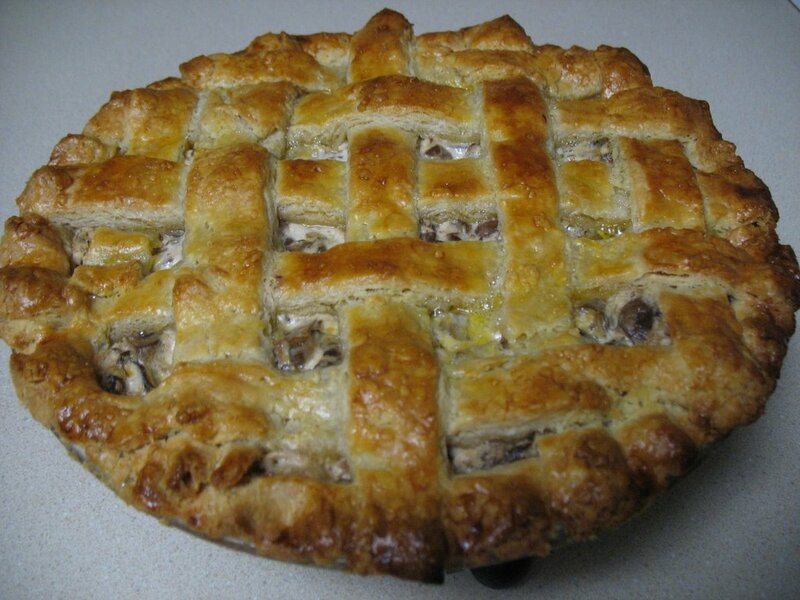 A latticed pie, at that. Much of it, I think, was due to Alton Brown's crust-making technique — and, perhaps, I'm also getting the hang of this crust thing. Some important points, I've learned, when it comes to pie: Make sure the butter is really cold, frozen even. Cool the filling before pouring it in. Use the dough that hangs over the pan to fill any tears or holes that might occur. Handle as little as possible! From Mr. Brown, I learned an awesome method of rolling out the crust without making an awful mess of it: Take the newly-formed dough, put it in a gallon-size zip-top bag, cut open the sides, then roll out. Upon opening the bag, place a pie pan bottom-side down on top of the well-floured dough. Carefully flip this whole thing upside down, then peel away the second side of the bag so that the dough is exposed. Fit a second pie pan one top. Turn back right side up, and remove the spare pie pan. I made the crust, including the lattice pieces, and the filling the night before. Then, a couple hours before Thanksgiving dinner, I put the whole thing together. 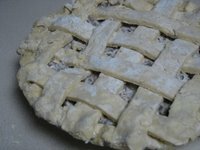 Even though my lattice pieces were uneven sizes, I managed to make the top crust happen by fitting some pieces together like a doughy puzzle. I even fluted the sides. Sort of. It came out of the oven golden brown and smelling of creamy mushroom goodness. I felt like the proud cook taking the turkey out of the oven: it looks pretty, but is the meat really dry and tasteless? In this case, I wondered, "How did the crust turn out?" The first taste test proved it to be flaky and flavorful (thanks to the butter and sour cream), with a crisp edge. And I really liked the mushroom-cream cheese filling. And like all good Thanksgiving foods, the leftovers were enjoyed for days to come. For crust: Whisk first 3 ingredients in a large bowl to blend. Add butter and cut in with a the back of a fork or a pastry cutter (or use a fodd processor) until coarse meal forms. Add sour cream; stire until dough comes to gether. Shape dough into a disk; divide into two pieces, 1 about 2/3 of dough and 1 about 1/3 of dough. Roll out larger piece on a lightly floured surface to 14-inch round. Transfer to 10-inch glass pie dish; trim overhang to 1 inch. Roll out smaller piece to 12-inch round. Slide onto rimless baking hseet; cut into 1-inch-wide strips. Chill crust and sough strips on sheet at leat 30 minutes and up to 1 day. Preheat oven to 400º F. Spoon filling into crust in dsh. Place dugh strip atop filling in lattice pattern. Fold strip ends and overhang under. Crimp edge decoratively. brush lattice with glaze. Bake pie until crust is golden brown and filling is heated through, about 45 minutes. 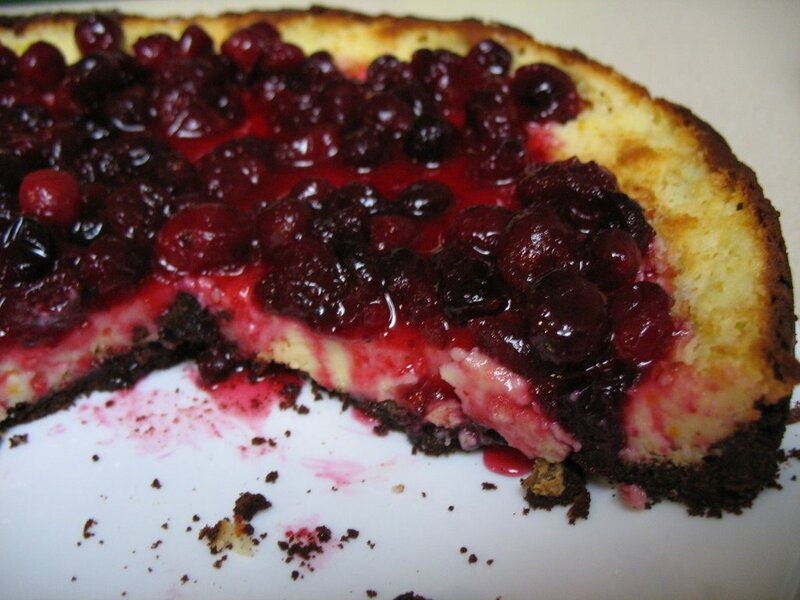 Cool pie 30 minutes. You did such a good job!!! I'm not a great piemaker, so I really admire your efforts. I love the savory pie idea. I'm looking forward to what you'll make next! Great lattice work! 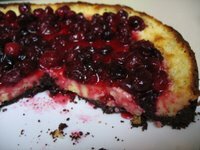 Alton Brown is crazy, but his techniques really seem to work. He's one of my favorite Food Network Personalities.